Andy “The Rock” Bloch says that he started playing poker seriously in 1992, when he entered some $35 weekly tournaments once a month. By the end of the year, he had won an entry to a No Limit Texas Hold’em event in the World Poker Finals tournament. As incredible as it may sound, that was the first time he ever played No Limit Texas Hold’em; although he was not new to the intricacies of card playing. From an early age, Andy started playing various card games with his family. He had a natural gift with cards due to his math skills and competitiveness. He used his math skills to obtain two electrical engineering degrees from MIT. Then he applied his analytical skills and obtained a law degree from Harvard Law School. By this point, cards were starting to play a big part in his life. Andy joined the MIT Blackjack Team that was featured in a book called “Bringing Down the House”. He skipped his last week of law school classes to play in the Main Event of the 1997 World Series of Poker. In a low-tech hole card cam trial, Tom Sims was looking for a volunteer to “sweat” and record all his hole cards and Andy Bloch agreed. His records turned into a two-part Card Player Magazine article. 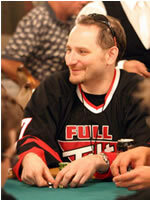 Andy didn’t leave his college education behind, passing the bar exam in 1999; however, he decided to delay his law career and go back to poker, a decision he hasn’t regretted so far: he made two World Series of Poker final tables in 2001, a first place finish in the $2,000 Seven Card Stud event at Foxwoods in 2002, and two World Poker Tour final tables during its first season. Andy had 2 wins in 2005; he won the World Series of Poker Circuit Limit Hold’em tournament at the Rio in Las Vegas and the Ultimate Poker Challenge $10,000 Final Event. Bloch also secured a sixth place finish in the Mirage Poker Showdown Pot Limit Omaha tournament and a seventh place finish at the $2,500 No Limit Hold’em tournament at the Ultimate Poker Challenge. Bloch cashed five times at the 2006 World Series of Poker alone. He placed second in the $50,000 H.O.R.S.E. event, winning more than $1 million. He won the Pro-Am Equalizer Tournament taking in the grand prize of $500,000 and placed fourth in the $20,000 event on Week 4 of Poker After Dark. In 2008, Andy finished 2nd in two prestigious tournaments: the NBC National Heads-Up Poker Championship, and the $10K WSOP Pot-Limit Holde'm event. Andy's live tournament winnings are in excess of $4 million. Nowadays, Andy Bloch continues to use his poker skills in tournaments across the world.